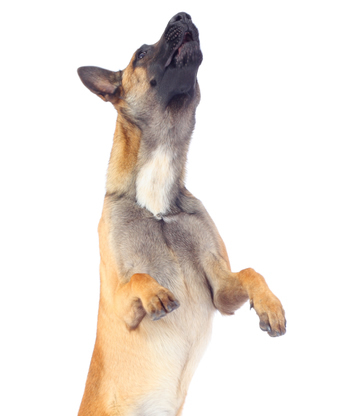 One of the behavior problems dog owners may have to deal with is their dog jumping up on people. This is not only annoying to the recipient and embarrassing to you, but more importantly it’s a dangerous dog behavior especially when you have a big dog. Even the most friendly dog can unexpectedly and totally unintentionally cause injuries. Nobody wants their friends or relatives to be hurt by their dog no matter how unintentional or minor it is, but in today’s world you also absolutely have to think about liability. Unfortunately, we live in a lawsuit happy society where just about any injury no matter what the severity or the how or why it happened is a lawsuit waiting to happen. Depending on the size of the person, even a small dog can hurt someone with their “Oh boy! Someone’s come to visit!” over-the-top enthusiasm. 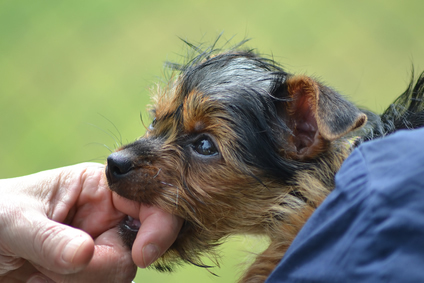 Although there probably won’t be any serious damage, to have your legs scratched or even accidentally nipped by a kiss-happy mini-dog can be painful. Now, think about a big dog showing you or your guest how happy he is to see you in the same manner. Holy OUCH! It can be a whole ‘nudder story to be greeted in the same fashion by 80 or 100 pounds of fur coming at you! Now think of what might happen if this is a child the dog is greeting. An out of control dog can knock someone over and even put some serious hurt on a person of any size. Thanks for writing, Shirley. I hope that we’re able to give you some help. Shirley didn’t mention her dog’s age so I don’t know if we’re dealing with a pup or an adult dog. It should be easier and quicker to redirect an overly-excited pup’s energy than it would be to change the behavior of an adult dog who’s had some time under their belts performing any unwanted behavior. If your dog is older, you’ll probably need more time and patience to work things out with them. Remember, old habits die hard so the older the dog the harder and more time it may take. You may have to really work at being patient. Breaking bad habits can be more difficult than training new good habits in a dog who isn’t old enough to have learned bad behaviors that must be changed. One of the things you can do when someone knocks on your door and your dog gets overly-excited is to confine the dog before answering the door. By crating your dog or putting it another room and closing the door you keep your guests safe and your dog time to calm down. If it’s a delivery person or someone who’s say just stopped by to drop something off and they aren’t going to be there more than a minute or two, your dog really doesn’t have to meet them. People are generally fine with waiting a moment or two while you holler “Just a minute!” and then proceed to coral your furball before answering the door. Problem solved with the added plus that your dog hasn’t been given the chance to run out the door either. Now let’s move on to guests who actually came to visit and will be joining you for a cup of coffee or even staying for a few hours. We use this technique on our own dogs because although they don’t jump up on people and Nissa is a gracious greeter, our Riley is just absolutely way to intense to allow him to meet and greet people at the door without our intervention. For the sake of fairness and consistency, both dogs are treated alike. The first thing I did was to decide on where I wanted our dogs to go to when someone comes to the door. The location you choose should be far enough away from the door in order to give you time to react should you need to. At our house it’s a rug on the far side of the room from the door with enough space between the rug and the door that I have time to intervene if they should break their down/wait command. I then practiced downs and waits on this rug when there were no interruptions and added teaching the word “rug” which signals them that’s where they are to go when I use the word. Eventually they got the idea that when Mom points to the rug and says “Go!” they go. I then give them the down command and once down, the wait command. When it comes to down and wait, I’m big on using visual hand and arm commands for additional emphasis. For “Go” I extend my arm out in front of me and point to where I want them to go while simultaneously speaking the word “Go.” Once there, I down them by extending my arm, pointing towards their noses and then drop my arm while continuing to point all the way down to the rug and simultaneously speaking the “down” command. 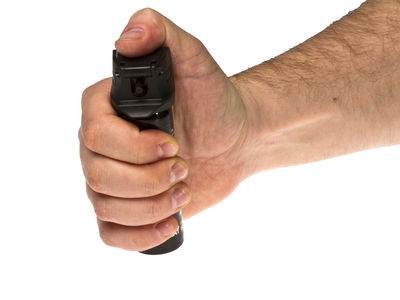 After they’ve assumed the down position, I hold my arm out in front of me and open my palm just like a crossing guard for kids to stop them from crossing and speak the “Wait” command. All verbal commands are spoken in my “Mom means business.” tone of voice. This means I speak firmly with authority, I don’t yell. Stand relaxed and still with hands at your sides. Do not look at or speak to the dogs, look at me, speak to me. Allow the dogs to sniff without touching them. My FurKids must wait on their rug until I see that they’re calm before being released. I then verbally tell them to “Come say hello!” in a happy but not overly excited voice. After the dogs have had a moment or two of sniff-time, the visitor can then pet them all they like. By the way, our rules apply to any meet & greet not just door greetings. No one is allowed to approach our dogs. Our rules must be followed and our dogs must approach and sniff anyone anywhere who wants to meet them. We come to them, they do not come to us. This is not only a safety measure but is the correct way to meet & greet a dog. Allowing anyone to approach a dog rather than allowing the (calm!) dog to approach the person can be a bite waiting to happen. Until your dog gets good at greeting people, you might want to think about adding a leash to the routine. I would not use a neck style collar but a Gentle Leader or chest type instead to prevent injuring your dog. If your dog starts to jump up on someone, firmly say “OFF!” as you gently and calmly lead your dog away. If you’ve got a stubborn dog you may have to also use the “come” command after the “off” command. This does not mean jerk the leash, pull hard on the leash or to use any amount of strength that might injure your dog. Seems to be habit for people to use the “down” command when they want their dog to get off something like a person, a couch, a fence — whatever. To most dogs “down” means to lay down. Let’s say your dog is laying on the couch and you want him off of it so you tell him “down.” He looks at you but doesn’t obey. You get frustrated and figure he’s being stubborn or that you’ve got a stupid dog on your hands but did you ever wonder why some dogs don’t always respond real well to getting “down” off a couch they’re laying on? Did you ever stop to think that at that point your dog is scratching their head in bewilderment because in their mind – they already are down! To me it really doesn’t matter (that I know of) what kind of inappropriate behavior a dog might display when it comes to door greetings, the point is that the dog should not be allowed to continue bad behaviors and must be taught a new way to greet people. It’s not their door, it’s yours and your rules must override their bad behaviors. Pretty much any overly-excited dog behavior can and should be redirected to the dog learning that calm gets him what he wants, excitement does not. There are other ways to handle this issue but our crate and rug techniques work for us. I hope this helps you and that you’ll come back and let us know how it goes. Thanks again, Shirley, for the opportunity to share with other dog owners! Great blog post! I need to strat putting in practice some of these recommendations for our 2 70lbs muscle heads. Glad you found my suggestions useful, thanks for dropping by!